Regular readers of Indolaysia will know that I really like bak kut teh, the porky soup whose name literally means “pork bone tea.” See here and here. I’ve decided that this is my favorite Singaporean food. 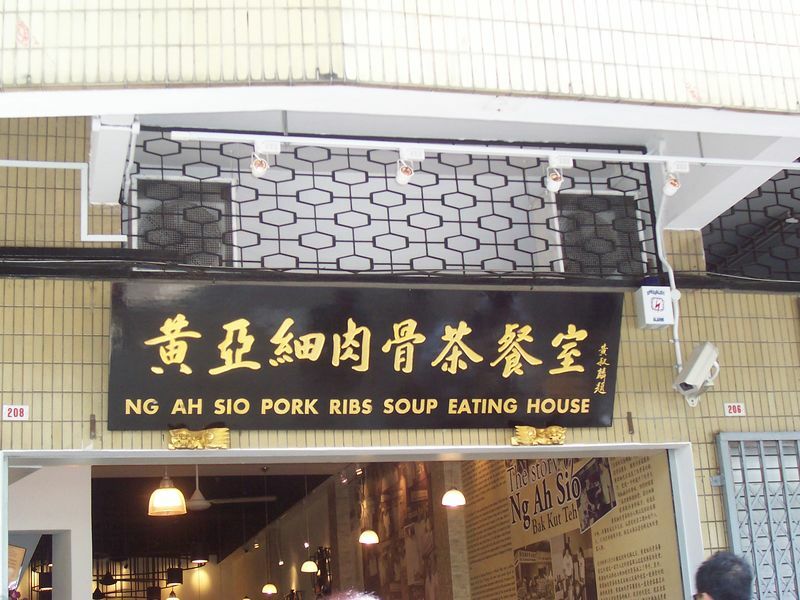 On the recommendation of a friend I tried a place called Ng Ah Sio Pork Ribs Soup Eating House today for lunch. Yummy. Unlike the Malaysian version whose recipe we tried above, this one is an assertive, peppery broth with big chunks of spare ribs in it and a pronounced garlicky note as well. The broth is rich and oily, the color of muddy water. Packs a punch. Because I usually eat alone, hosts and hostesses will often seat me at a table with someone else. A bit awkward but I don’t really care. Today they sat me down with a real character, though. His name was Mr. Ng, although he’s no relation to Ng Ah Sio. Mr. Ng has been coming to that restaurant every day since it opened at that location in the late 1980s. The waitress confirmed this. I’m not sure what his story is, but Mr. Ng is a character. He explained to me in some detail the benefits of eating bak kut teh in a particular way, that is, combined with endless cups of strong tea. (The idea is that the astringency of the tea counteracts the fattiness of the broth.) He prepared the tea in the traditional Chinese fashion and shared it with me, which was nice. He also, though, does something unique. As I was sitting down he was removing a little knife from his pocket. The waitress showed up with a head of garlic and a little bowl. Mr. Ng very deliberately removed a little napkin from his pants, spread it out, and then used it as a placemat as he proceeded to shave the entire head of garlic into little thin slivers. He made two piles (a big one for him, a little one for me), then separated them into two bowls, and poured over them a big slug of the dark rice vinegar that sit on the table as a condiment. He instructed me to use the garlic-vinegar mixture as a topping or addition to my soup. It was quite tasty, although I’m glad that JMP isn’t around to smell my breath. You can see pictures of my food adventures, and of some various interesting sights around town, here.